Now that you have registered your account, it's time to continuing with the process of registering yourself as a coach. To proceed, first you will need to go to your YMCA registration website. Next click Sign In and login using your login email address and the password you created for your account. In the side menu click YMCA Admin > Coaches. If you are a TeamUnify customer and need to add a coach skip to Converting Members to Coaches. Once you have found your name, click on your name. If for some reason you do not see your name, search for it in the Search for Coaches field. Your details will now load into view. As a requirement for YMCA Coach Registration, you will first need to ensure that all of your General Information is complete and accurate. Inside your Coach information scroll down to the Update Certificates area. 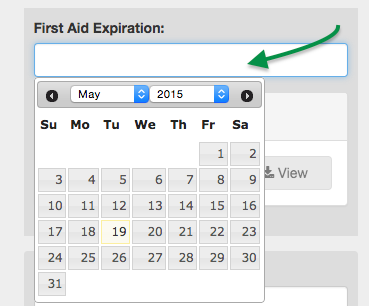 In this area you are asked to input valid expiration dates for each of the required certifications. In addition you also need to upload valid copies of certifications for verification by YMCA of the USA. 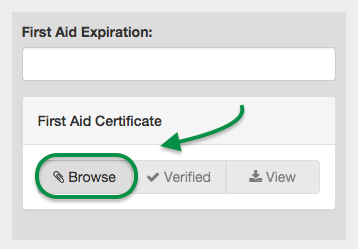 To do this click Browse in any certification and then select your file/certification verification from your files. This file must be on your computer before you can upload it. Once this information is entered, click Save and then your information will be uploaded to the YMCA Database. In the next step we will cover adding a new Coach for TeamUnify Customers. Skip to the last step if you are a NonTeamUnify Customer. For TeamUnify customers it is easy to convert current members to YMCA Coaches. Simply go to Team Admin > Account/Member Admin and then the Members Tab. Select the member(s) you would like to convert to a YMCA Coach and then click Edit > Convert Members to YMCA Coaches. To verify the change you can go to YMCA Admin > Coaches tab and then find the Member on the list. In the next step we will talk about adding a new coach/member and setting their Admin Level. There are a few differences when adding a new coach to your YMCA Admin as a TeamUnify customer. In Account/Member Admin (AMA) you can convert a Member and Account to a YMCA Coach. This can only be done by a SuperUser. If you are not a SuperUser and you would like a YMCA Coach login or to manage a coach from the YMCA Admin please ask your team‘s web administrator or SuperUser to add them. 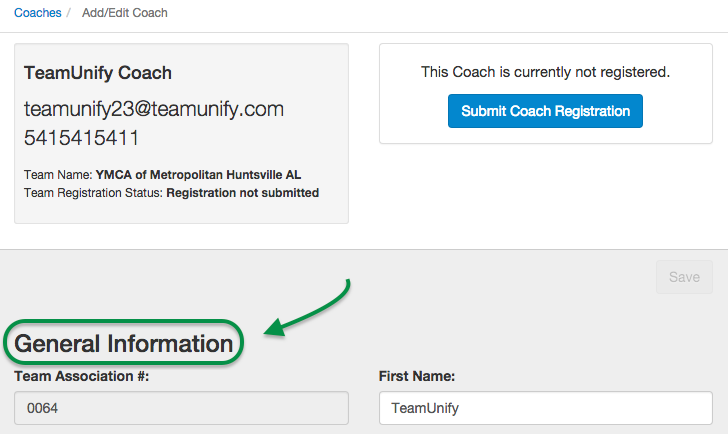 If you directly add a coach from the YMCA Admin a Member and Account will automatically be generated in your TeamUnify Account/Member Admin (AMA). If the Coach is a member it is best practice to convert that member to a YMCA Coach as seen in the previous step. If you would still like to add a new coach login using the YMCA Admin go to YMCA Admin > Coaches, then click the + Add Coach button. Fill out the following information. Make sure to set TeamUnify Admin Level then Save. The new Coach will be added in your AMA and you can then send them login information via the Communicate button in AMA. Lastly, to submit your coach registration, scroll back to the top of the page and click the Submit Coach Registration button. That is it. You will now receive additional details via email, and you will see the status of your registration on that page. You can return to this page at any time in the future to review the status of your submission. You are now done with the coach registration submission process. If you need to submit registrations for other coaches, you may do so now, or you can submit your Team Registration if it has not been completed already. If you would like to remove them as a coach from YMCA Admin, but not as a member, select the member check box, then click Edit > Remove As YMCA Coach(es). Next we will cover requesting a Meet Sanction.